Saw one like this on Ebay, If you know the old Martin mandolins that have an angle-top, imagine one with the angle pointing inward rather than out. Can anyone give me a highly subjective opinion of what they sound like? I love this shape. Interesting how they created the break angle across the bridge. This particular one was built by Rene Gerome, but the system was invented (and patented) by the French luthier Gelas. They were very popular in France, and Gelas mandolins were built for many decades. I've seen instruments dated from the 1910s to the 1970s. I've never played one, although I've placed a few half-hearted bids on Ebay now and then to catch one. If you search the archives for "Gelas", there have been a number of discussions on this layout. The diagram below (from crane.gr.jp) shows the basic design, with the double-top and the peculiar upward string break angle. 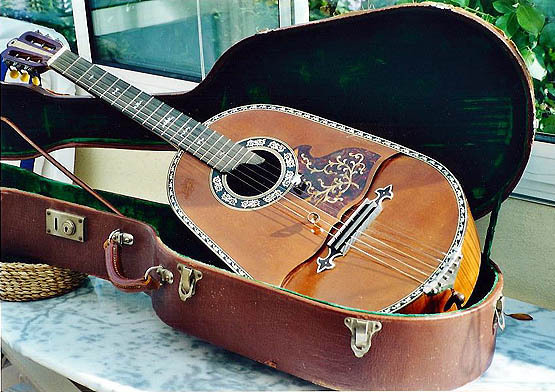 That style mandolin was first developed by Lucien Gélas, a French luthier in Marseilles. These instruments had a revolutionary design feature to increase the volume of the sound -- the 'double table d'harmonie' or second soundboard, parallel to the first -- and were extremely popular with French orchestras, many of whom used exclusively Gélas mandolins. Actually I am not sure why Sparks says that the soundboards were parallel. It looks more like they are at an angle with one overlapping the other. Looks like Martin and I cross-posted and duplicated some info. I have seen a photo of at least one Martin guitar with a similar negative neck angle. Here is a rather fancy Gélas at Sinier-DeRidder. This one "Gélas" was made by Gaudet, Paris 1915. (Gélas was a trademark and patented instruments. Interesting... I went thru almost all my jpegs of Gélas mandolins and all have the label of other makers with a mention of the Gélas patent. jim, can you post some jpgs? I'd love to see the realm of possibilities. I'm very curious how they sound. Does anyone still build them? Here is a 1911 Gélas/Gaudet mandocello. Maybe Lefty knows the answer. I don't think anyone still builds them. A Gelas classical guitar. There were also bowlback mandolins and even ukuleles. First another one from Crane. You will notice this one is "Gelas" branded, but "J.R", not Lucien. The Dutch dealer Boetzkes has had two Gelas mandolins on offer for several years now, at fairly affordable prices. This one is from 1929, offered at 450 Euro. The other one at Boetzkes is from 1973 (the youngest I'm aware of), offered at 325 Euro. And finally, here is a 1952 Gelas, from another Dutch dealer, Palm Guitars. My Austrian friend Christian sent me this patent for Gelas guitar (which applies to the construction of the mandolin as well). I, too, don't think anyone still builds them. There seem to be a fair number of them around, at least in Europe. Despite the odd look, they must have been pretty popular. The heavily-inlaid mandolin (above), posted by JGarber is now for sale in Europe for about $2800 US. I would love to hear what it sounds like. That one has been there for over 2 years now. I don't know any classical players who play this style of mandolin these days. That is not to say that they are not fine instruments, just strange. I have never played one myself. I, too, have never played one and don't know anybody who has. I think they were only ever a French/Belgian thing and don't seem to be in use there any more either. Maybe Richard Walz has some direct experience. I remember only one Cafe member who has actually played a Gelas-type mandolin (or at least his father has), and talks about it in this thread. Tomorrow, I'll visit a friend who owns some Gelas and other double soundboards instruments, including a mandobass! I'll take some pics, and perhaps sound files. yah i was thinking the same thing. that two-piece table would put a lot of stress on that bottom bout. However, I have seen so many old ones for sale on the internet, (all of them from europe) that this is not a generic problem. There are so many survivors over 60 years old.